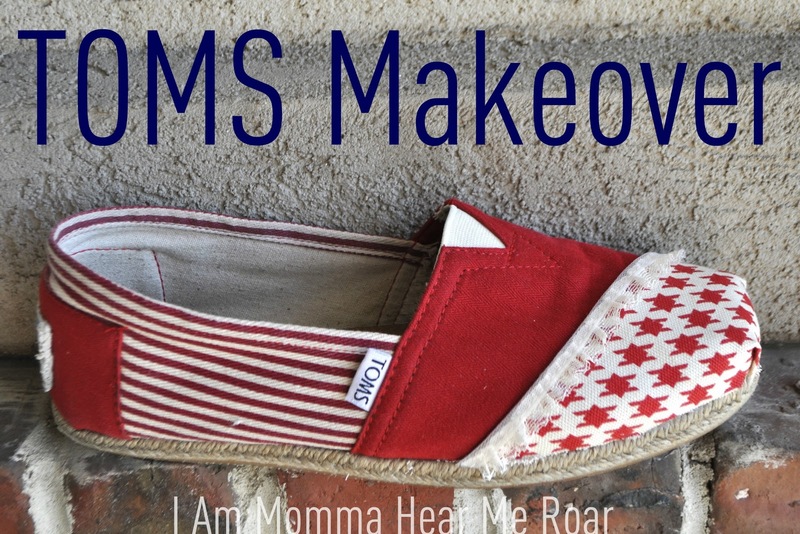 Many, many months ago my mother-in-law bought me some Toms. I was so excited and I wore them a whole lot. I wore them enough to get a hole in the front of them. So I gathered some supplies to fix the problem. I happened to have some coordinating fabric in my scrap bin. I pulled out Aleene's Fabric Fusion Peel and Stick Sheets, which were PERFECT for this project. Here's how it went down. I love dry adhesives because there is NO mess. There's no wet glue seeping through the fabric. It's simple and clean. There are several sheets in the pack. They come with the adhesive sandwiched between two pieces of white paper. I peeled one side off and applied it to the shoe, lining it up with the long seam across the top of the shoe. Then I smoothed it over the front middle and then along the sides. Naturally, you'll need to pleat it where the pleats are in the shoes. Then just trim the paper to match the shoe. The sheet didn't cover the entire front, to I added a few more pieces until the whole front area was covered. Once you've got the paper everywhere you can smooth it over the shoe to get the adhesive to adhere and the just peel off the paper. Now it looks like this. Then applied the fabric the exact same way. You could apply a little fray check around the bottom, but if you got the adhesive all the way to the bottom I don't think you'll have to worry much about fraying. It's stuck on quite well. I added a little extra adhesive inside the pleats to get them to stay flat. I smoothed the fabric over to get it really stuck on there - especially at the bottom. I didn't like the raw edge of the fabric across the top of the shoe so I decided to add a little bit of lace. I used the dry adhesive again, cutting it into thin lines and then I laid the lace over it. And BAM. They're done. No waiting until they are dry because they already are! And it's kind of fun to have a pair that's totally unique. I'm so bookmarking this page! 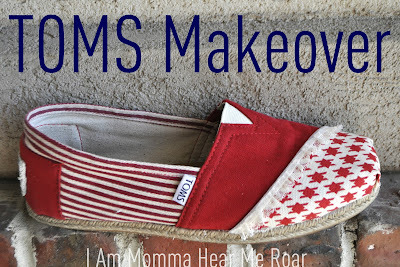 I have like 11 pairs of TOMS, and although they are all in pretty good shape, I will totally do this if I need to spruce any up! I just got my first pair of Toms, and not that I am excited for them to wear out, but excited that I don't have to throw them out when that time comes. I've had the idea in my head for awhile that I could recover them but didn't know which adhesive method was best. Oh, I will definitely be doing this soon! Mine have a coffee stain on the top part and it'd be perfect to cover! Holy Cow, this is the cutest thing EVER! Such a great idea! When the young man was gone, we countermanded our candles, and ordered some cheap tomsbrandy and water. The great billows had gone over our head. The Royal Nautical Sportsmen were as nice young fellows as a man would wish to see, but they were a trifle too young and a thought too nautical for us. How did they hold up? or I should ask how did the sticky paper hold up during wear? WOW! Talk about creativity and DIY spirit. I would never thought of doing a project like this! Definitely bookmarking this page in case my TOMS are torn in the future. Thanks! WOW! Talk about creativity and DIY spirit. I would never thought of doing a project like this! 285 million people are visually impaired. 80% don't have to be. With your help, TOMS is looking to raise awareness for visual impairment around the world by wearing sunglasses inside on World Sight Day, October 10, 2013. Upload a picture of yourself participating in World Sight Day and use #BeShady to see who else is in the effort to help those in need of eyewear. The toms shoes sale is hot now. Do not hesitate any more, just trust these best toms shoes and get them home now! Christian Louboutin Louis Spikes Sneakers are very great with high quality and cozy feeling.